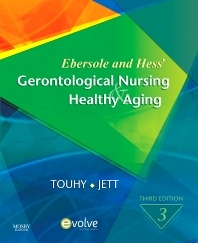 With a strong focus on health and wellness, this gerontological nursing text offers you a holistic perspective to caring for older adults. Designed to facilitate the healthiest adaptation possible, this text identifies potential problems that may occur and the means to address complications, alleviate discomfort, and help older adults lead healthy lives. Disease processes are discussed in the context of healthy adaptation, nursing support, and nursing responsibilities to help you gain an understanding of your clients’ experience. Focus on health and wellness establishes a positive perspective to aging. Careful attention to age, cultural, and gender differences are integrated throughout to help you understand these important considerations when caring for older adults. Healthy aging strategies maximize the healthiest behaviors of clients with dementia and their caregivers. Consistent chapter organization includes learning objectives, research, and study questions/activities to make information easy to find and use. Incorporates assessment guidelines throughout provide useful tools for practice. End-of-chapter activities and discussion questions help you expand your knowledge and understanding of the content. Resource lists provide you with additional means to explore ways to care for the older adult.